(Athens, November 22, 2017) – The Greek government, with the support of EU member states, should act now to end Greece’s “containment policy”, 20 human rights and aid groups said today. The policy forces asylum seekers arriving on the Greek islands to remain in overcrowded, unsafe facilities, an urgent concern with winter approaching. 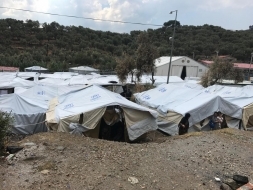 Conditions on the Greek islands have continued to deteriorate in the month since 19 nongovernmental groups wrote an open letter to Greek Prime Minister Alexis Tsipras, calling on him to move asylum seekers to the mainland, where better conditions and services are available. Members of the group recently asked to meet with Tsipras to discuss the most urgent needs on the islands and provide recommendations for addressing this increasingly dire situation. They have received no response. Over the past month, the Greek government has transferred 2,000 people from Samos and Lesbos to the mainland as a one-time emergency measure. When the government announced this initiative in October, these islands were already 5,000 people over capacity. It was clear then that this measure, while helpful, would not suffice. As of November 20, 2017, the hotspots on Lesbos, Samos, and Chios are hosting 7,000 over capacity: 10,925 people are staying in facilities with a capacity of just 3,924. Thousands, including single women, female heads of households, and very young children, are being forced to live in summer tents, essentially sleeping on the ground, as the weather worsens. Some women are forced to share tents with unrelated men, putting their privacy and safety at risk. This will be the second winter asylum seekers have had to spend in unsuitable facilities on the islands since the EU-Turkey Deal went into effect. “The EU-Turkey Deal is condemning refugees and migrants to a second winter in squalor on the Greek islands. Instead of trying to maintain the deal at all cost, European countries and Greece should urgently work together and move asylum seekers off the islands,” said Gabriel Sakellaridis, director of Amnesty International in Greece. EU and Greek officials have cited the EU-Turkey Deal as a justification for the containment policy. However, forcing asylum seekers to remain in conditions that violate their rights and are harmful to their well-being, health, and dignity cannot be justified, the organisations said. As such, the groups have also written to EU member state ambassadors to Greece urging them to immediately call on the Greek government to suspend, the containment policy. The groups urged Prime Minister Tsipras to protect the human rights of asylum seekers trapped on the islands by ending the containment policy, immediately transferring people to improved conditions on the mainland, and making a commitment to ensure that no one is forced to sleep in a tent. Because the “containment policy” is being implemented in response to the EU-Turkey deal, the organizations highlighted the responsibility of the European Commission and the EU member states to address the situation on the Greek islands and to press the Greek government to reverse the policy. EU member states should support the Greek government’s efforts to ensure the safety and dignity of asylum seekers in EU territory, including by expanding safe accommodation and access to services on the mainland. About Terre des hommes: Terre des hommes is the leading Swiss child relief agency. Founded in 1960, we are committed to improving the lives of millions of the world's most vulnerable children. Through our innovative protection and health projects, we provide assistance to over three million children and their families in almost forty countries each year. In Greece we use psychosocial activities, counselling, safe shelter and non-formal education to provide refugee children and their families with the support and protection they need. Read more about our work in Greece here. Picture © September 2017 Emina Cerimovic.